Playful, silly, and creative, Lexa thinks life is meant to be fun, which means being yourself no matter what! Lexa dreams of being a film director one day, and she has a really great sense of humor. She loves to go to cool movies, visit art museums, and perform "slam" poetry. She also loves to dance, dance, dance! Lexa's friends absolutely love her because she can make them laugh even on a bad day! 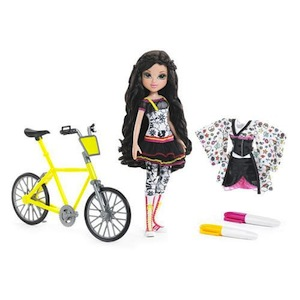 Includes 2 markers, Lexa Doll, 2 outfits, and bike.